Today's snack bento was pretty quick to prepare. I stuffed thin slices of spam inside the onigiri and decorated with Hello Kitty shaped thin layer rice on the top. To make the thin layer rice, you just need to put rice between two plastic cling wraps and use roller pin to flatten the rice. After that, press with a small cutter to get the Hello Kitty's head shape. Press softly the cutter on the onigiri then put the thin layer rice on the top, so the thin layer rice can stick properly. Onigiri boxes are fun to use. They come with different sizes, colorful, and sometimes with cute character on the lid. Those 2 in the pictures are pretty small, just perfect for the kids. Inside the other box : fried chicken drumlettes, green tomato & cucumber, and strawberries. Please join "What's For Lunch" at Shannon's blog. I added today's bento. It's fun event for every Wednesday, so we can share our bento picture to others. So lovely, once again! Beautiful Hello Kitty faces and flower decorations. This sweet bento art added sparkle to my morning, thanks Lia! That is so cute! Did you use food dye for the pink? Perfection!! Thanks for the tut on the thin rice design, love it!!! aww.. hello kitty and its pink! what else a gal could ask for? thanks for the thin layer rice tip! 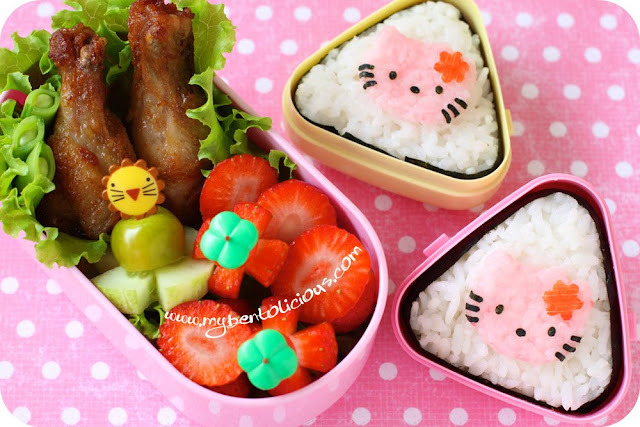 The Hello Kitty faces look so adorable and love the onigiri boxes, fitted so nicely. Your bento looks very tasty! @仪仪妈咪 : Thanks a lot 仪仪妈咪! thanks so much for sharing this brilliant idea of rolling out the rice for a flat cut-out! i can't wait to try it, and hope mine come out even half as cute as your adorable HKs! This has got to be the most creative looking bento ever. I just started getting into it and hopefully with enough time, patience and hard work I'll create something worthy of bento. Hi! I love your blog and the bento boxes you made for your kids are beautiful! I have this pan in Mickey mouse pattern but I just couldn't made the pancake as good looking as yours, would you mind sharing your batter recipe? thanks!